Growing and making wine is an ancient undertaking fraught with calamities, disappointments and mysteries galore. Things go wrong, necessities fail, and nature becomes petulant and uncooperative. Winegrowers stumble about in frustration, uttering the language of rural despair. They curse their fate; they wring their hands, they shake their fists at the sky. And this is precisely where wine dogs come in. As we all understand, dogs are the most skillful psychotherapists known to human kind. When nobody else cares or understands, a dog casually appears out of nowhere, and in two shakes of a sympathetic tail, brings vital perspective and sets things right. As skillful counselors, as compassionate consolers, as wise court jesters, their healing work is famous and undisputed. Their soulful depth is as precious in the vineyard as it is in the shed or the cellar – or anywhere around the house for that matter. In fact the term ‘working dog’ refers mainly to the fact that dogs are miracle workers. Of course, not all of these miracles are benevolent or helpful to the owner, as various biographical notes about certain dogs in this book will verify. How a pooch can manage to open a fridge door and snaffle three kilograms of pork sausages destined for a birthday barbecue is indeed a miracle. How it managed to eat all of the sausages in just a few minutes, including the paper they were wrapped in, is indeed a miracle within a miracle. Interestingly, although the wine dog usually has a frightful weakness for sausages and kleptomania, it does not normally drink wine, and this is simply because it does not need to. The reason dogs have no need for wine is simply because they have tails to wag. This is the same reason why they do not make art. The tail is truly an amazing piece of equipment. If humans had tails to wag they would also not need to drink wine or make art. Gambling, playing chess or golf, compulsive interior decoration, riding vintage motor bikes or dancing the tango; all these sorts of activities would be unthinkable and unnecessary if we had tails to wag. What a pity. This brings us to the delicate subject of human shortcomings. Even the briefest glance into a newspaper or television screen these days will probably confirm to us that humanity is not doing very well just lately, and in many cases is behaving quite dismally. A glass of wine with the evening meal can be helpful in easing the disappointment about one’s fellow creatures, and it may ease the discomfort that comes from being constantly exposed to so many photographs of crazed politicians, celebrities and models that are forced on us each day in the media, or gigantically emblazoned on buses and billboards wherever we go. Oh those weird, anxious, desperate public faces of humankind. And even a trip on an overpopulated suburban train may leave our minds overloaded with strange faces that are not overly friendly. How we tire of them, and how we long for the sight a natural face that is not devious or pained, not forced or false, but is innocent and good natured… That looks intelligent and sincere; that looks sweetly open and wise. This is where books about wine dogs come in. Reader, I ask you; look at the array of faces portrayed in this book… And what is this book if not a colorful gallery of vibrant portraits; interesting radiant faces that smile eagerly from the pages. Unique faces of dogs depicting enormous intelligence and wellbeing. Faces that have lived. Faces of contentment. Alert unpretentious faces making a go of life and doing their best. Humble loveable faces full of honesty and character. Spirited faces. Cheeky soulful smiles in abundance. Is this not heartening to behold? Is this not an effective simple antidote to world-weariness after another worrisome day on a troubled planet? Readers, wine and dog appreciators… settle back in a cosy chair with these beautiful portraits of these glorious creatures. Contemplate their vitality and grace; their sheer dignity, then meditate upon the your inner pooch and the joy therein. What a blessed relief it is. Seeing as all of these wine dogs are listed as having owners, I think a small philosophical question about dog ownership is now appropriate. Can anyone really own a dog? The idea seems strange somehow, just like the idea of owning one’s children or spouse sounds all wrong. I think we might legitimately say we are the dog’s chief benefactor, best friend or personal assistant; but owner…? 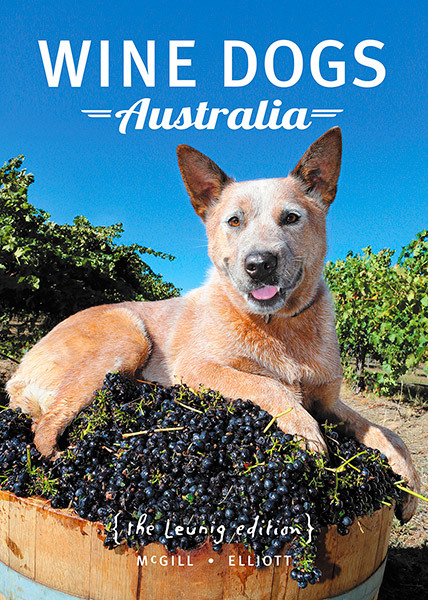 Hmmm, it seems to me that the wine dogs in this book are pretty much their own people; easy going, charismatic, mostly cooperative, and amiable conversationalists for sure, but not entirely ownable. Isn’t that one of the qualities we love about these fabulous dogs? Surely they are free spirits and all of them such unique individuals. And finally, a note for the more pragmatic readers who need lots of useful hard information that will solve problems. The task of naming a new pup can be one such problem; it can be a drawn out and difficult consideration. Quite mind-bending actually. Many glasses of wine may be required. But worry no more, for here in these pages the problem is solved, and you will discover that this volume also amounts to a catalogue of marvelous dog names, all of great distinction. Just go slowly back and forth through the book and choose a dog’s face you are especially attracted to (the dog that is obviously falling in love with you) – and at the bottom of that page you will find its name – and of course this will be the perfect name for the beautiful amazing new pooch. Cheers.